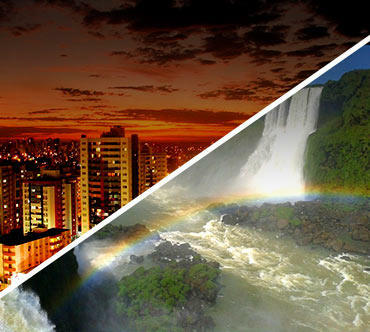 Enjoy your bus trip to Iguazu Falls and get to know Brazil like never before! Iguazu falls is one of the most remarkable landscapes in Brazil and is located in the city of Foz do Iguaçu, in the border of Brazil with Argentina and Paraguay. In the Brazilian side, Iguazu Falls is the third most visited place for foreigner tourists in Brazil and since the city is in the very south of the country, far from the big cities, flights can be a very expensive choice to get there. The weather can be very hot in the summer with an average of 35°C and chilly in the winter, reaching almost 0°C in the darkest days. The rain is well divided along the year and can be a little less frequent in the winter. If you decide to take a bus to Iguazu Falls, the distance and the timing of your trip can vary a lot depending from where you are coming from. Normally, a bus ride will always be cheaper than an air ticket and since most of the tourists are crossing the country to get there, it’s a great opportunity to get to know a little of Brazil by bus too. All year! The weather in Iguazu can be very hot in the summer with an average of 35°C and chilly in the winter, reaching almost 0°C in the darkest days. The rain is well divided along the year and can be a little less frequent in the winter. The bus station from Iguazu is located at Avenida Costa e Silva, 1601, Foz do Iguaçu, Parana state. If you need any help or tip from the bus station you can always give a call to their number at +55 (45) 3522-2590 but its not likely they will be able to speak any English. The bus station in Foz de Iguazu is opened 24h a day and counts with food courts, bathrooms with shower, ATM´s and more than 18 bus companies connecting the city to the rest of the country. Since it can be a long bus trip from Sao Paulo and Rio de Janeiro, most travelers prefer to make a stop for a couple of days in Florianopolis or Curitiba, halfway from Iguazu. 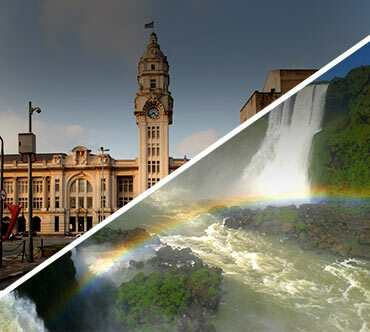 It’s a great chance to get to know two of the nicest cities in the south of Brazil and most of the time, you can get to know both, one in the way there and the other in the way back. Sao Paulo to Iguazu: Pluma is the bus company responsible for the bus route from Sao Paulo to Iguazu. The trip takes from 15h to 17h and the bus leave from the bus station TIETÊ in Sao Paulo, 5 a day. Rio de Janeiro to Iguazu: Pluma is the bus company responsible for the bus route from Rio de Janeiro to Iguazu. The trip takes from 21h to 23h and the bus leave from the bus station NOVO RIO in Rio de Janeiro, 3 times a day. 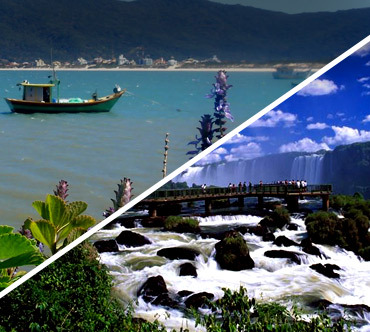 Florianopolis to Iguazu: You can go from Florianopolis to Iguazu by bus with PLUMA and CATARINENSE, two very traditional bus companies in the region. The bus trip takes from 15h to 17h and there are sleeper seats available at a higher price for who would like to sleep a little better along the way at night. Buses leave 4 times a day. Curitiba to Iguazu: Catarinense have about 15 buses a day leaving from Curitiba to Iguazu and the bus trip takes about 9h. You can choose sleeper seats if you are traveling at night. 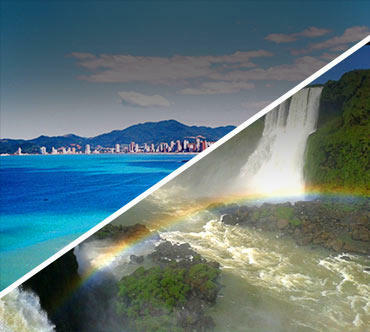 Bus tickets to Iguazu falls: Here at BRASIL BY BUS, you can book your bus ticket for more than 3.000 destinations in Brazil with the main bus companies in the country. Booking and cancelation are 100% online and international travelers can book it using their international credit card.